“I live next to a lake in Florida, so you can imagine the mosquito battle I had. Now, I can sit outside in the evenings and enjoy the peaceful setting without continuously swatting bugs. I bought this mainly to kill European Hornets (they look like yellowjackets except they are huge and are active at night, they are attracted to light and they would pop at my windows all night). They do sting and it hurts worse than any bee or wasp ever has. The first night I used this thing is was like a bloodbath. Over 20 dead European hornets in one night. The second night it killed over 30 hornets. Every two weeks another batch of workers is born and they are completely wiped out in 2 days with this thing. I recommend a Flowtron Zapper to all in need”. That is only one from more than 3700 customer reviews which have already had the experience of using this Mosquito Killer. Nowadays, electric mosquito zappers are the most effective and safe (non-toxic) way to solve a mosquito problem. If you, too, have worn yourself out making experiments with various gadgets, sprays and ointments against insects, the time has come for you to get acquainted with this device. It’s a real killer of mosquitoes, flies, bees, hornets and other insects – that is why it’s so popular among customers: Some of them called it Mosquito Assassin or Terminator. It is in Top-3 Best sellers in category of Bug Zappers. 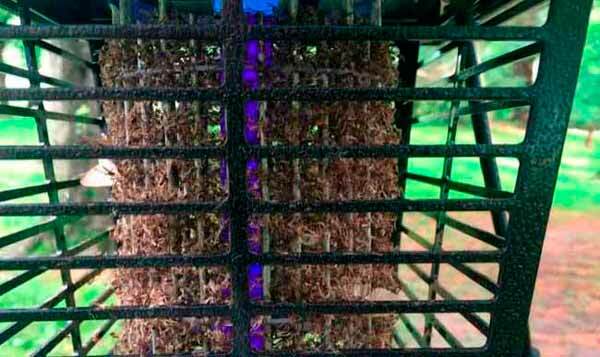 How does Flowtron Insect Killer work? The principle of modern zappers’ action is very simple. Ultra-violet lamp radiation attracts mosquitoes – and when they are drawing to electric grid, they are facing an electric shock. Boom! Users noted that it works on mosquitoes, hornets, flies, drain flies, and other flying insects. They said that just after 2 nights of Flowtron working, they were able to stay outdoors without sprays, citronella torches, or long sleeves. Many of them say that the first few nights “sounded like a Star Wars light saber battle” and “looked like fireworks” because zapper killed so often. Then you will see that the zapping slowed after 3 or 4 weeks: First, it reduced the mosquito population and then eliminated it, if you are pretty lucky. Flowtron received high ratings by homeowners who have a lot of flowers close to doors and windows, because different insects like these plants and can get into the house easily. It’s easy to clean with a leaf blower, for example, or compressed gas – such as Dust-Off (you can buy pack of 4 for ). There are some cons that we must warn you about it. Using Flowtron, you can harm other useful insects. Although many customers tell that they haven’t seen any dead ladybirds, butterflies, etc., the threat is real. Some customers share that they have found dead lightning bugs below Flowtron Killer and then stopped using it. For people who worry about beneficial insects, it’s better to use mosquito propane traps: These units attract only mosquitoes and other blood-sucking insects. Some customers complain that there is no night-time sensor (the only way to turn it off is to unplug it), so they have to buy a wireless outdoors remote to turn this on and off as needed. Never hang it in the vicinity of your usual sitting place, otherwise you will be clouded by mosquitoes and other flying insects very quickly. The device should only be used outdoors. It has a short cord and needs to be plugged in. To locate the device in the needed place you are most likely going to need an extension cord. The ring to hang it up with is not welded and has a large gap – you’d better to reinforce it before hanging. Plug in your Flowtron Killer several hours BEFORE you spend time outdoors near it. Use it with caution if you live in a rainy and windy area. If you really want to decrease the mosquito population, first get rid of standing water outdoors – and tell to your neighbors about this, too. Find other helpful tips among 9200 reviews. Can I leave the working lantern under rain? Though many people use it 24/7, 365 days a year, we would rather advise to you not to leave it under rain since it is an electrical device. Make sure it is kept under roof or awning, protecting it from external moisture or cover it not to allow water to penetrate through netting. At what time does the device work more effectively? It works more effectively at night, though it kills the insects at day, too. In addition, you may buy and set on a timer which will turn on Flowtron automatically for the period of maximal activity of biting insects, i.e. from sunset till sunrise. Can I simply put the device on table? The idea is not a very good one. In the first place, the lantern requires much air space to work effectively. When you put it on table, you hinder the air circulation. Secondly, live insects will be rushing constantly to this table while the dead ones will pile up on it. Is that what you want? Why can’t I use Flowtron indoors? 1. Due to the requirements of fire safety. Sparks which occur at killing insects may cause a fire. The probability of that happening is not great, but it should be avoided nonetheless. 2. Noise. The device makes certain sound and humming which will be heard over the house and will trouble those living there. So, Flowtron isn’t intended for house – you’d better use Indoor mosquito zappers. If you need indoor mosquito killer, read our review of the best bug zappers. Won’t it hurt birds which live in the forest near my house? Don’t worry, birds will be quite safe as such lights won’t attract them. How to clean the grid? Can I oil it a little to protect it from dead bugs sticking? This measure will be out of place. Instead, you may use vacuum cleaner (or a portable vacuum) ventilator, drier or a special balloon with compressed air to blow dead insects out of the device. If you have noticed the accumulation of killed insects under the device, then put a bin below it. It’s quick and easy, so good luck! Is it normal that the lamp is white? Everything is all right, it is white when it is turned off and becomes blue when the lantern is plugged in. But mind, if you have turned on the lamp and see that it is of orange color, it means that you need to change it for a new one without delay. Our site area is less than 1 acre but as we live in the vicinity of water we have lots of bugs and mosquitoes. What model of Flowtron will suit us best? Once mosquitos become a serious problem, you’d better take the most powerful model calculated for 1.5 acres, just to be certain that the problem will get solved. What about spiders and scorpions? Will Flowtron kill them? The lantern’s light can’t attract these creatures. 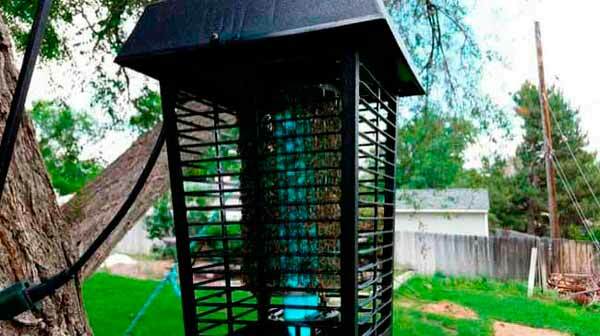 It will be able to kill only flying insects so you have to find another remedy against these pests. Does every model have a section for the mosquito cartridge or it is intended only for the most powerful one (80 watt)? Practically, every model has it, including one calculated for ½ acre (15 watt). What other products are bought frequently with Flowtron Electronic Insect Killer? Since the product can be used only outdoors, you have to hang it on the outer side of your house or on a special bearing which you can place anywhere outside your house. Pay attention to the Flowtron Wall Bracket for Electronic Insect Killers . Also, you can buy Flowtron Octenol Mosquito Attractant Cartridges, 6-Pack . Where can I buy Flowtron?